At Celtic Group Hostels we love groups and we love taking care of them in the best budget accommodation in Ireland. We have have hostels in Dublin City centre, Cork, Galway City, the Burren near the Cliffs of Moher and Connemara County Galway so you can enjoy all of the Wild Atlantic Way. 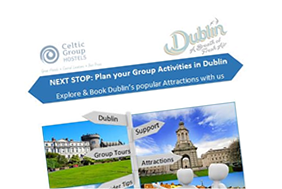 Would you like to add any other services to your group trip to Ireland? Tick from the list below and we will add this to your quote.